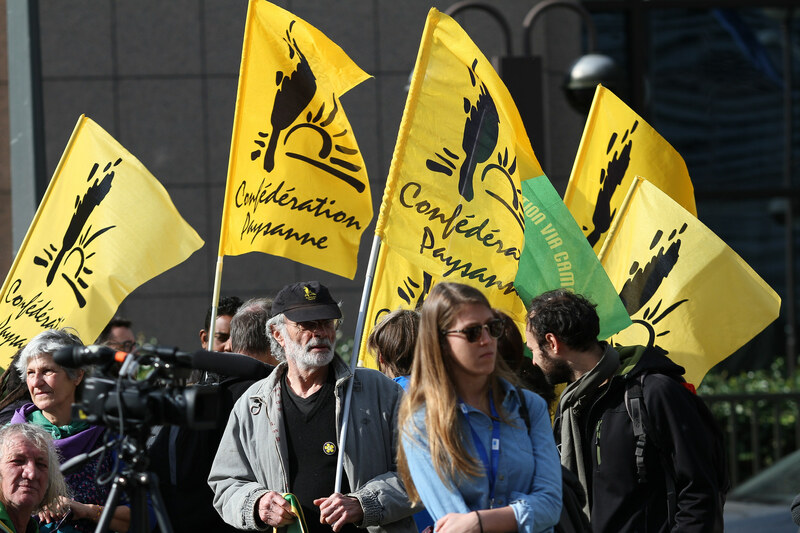 Brussels, 17 April, 2018 – In this international day of peasant struggles, commemorating the resistance and in defense of peasants persecuted across the world, farmer organisations from Belgium, France, Spain and even as far as Canada, converged with other social movements, labor unions and NGOs this #17April in Brussels to express their opposition against the current free trade deals (FTAs) negotiated by the European Union. “The agro-industry kills peasant farmers but in this war machine, FTAs play a fundamental role. With the CETA, Mercosur-EU, India-UE, the Indonesia-EU or other trade deals, consumers might be able to buy cheaper products, but what does that imply? The exploitation and annihilation of peasants. Handing our land, water, knowledge and rights to multinationals. Health risks and environmental damage.” Reiterated Claude Girod, peasant from la Confederation Paysanne – ECVC, outside the EU Commission. The dozen delegates from France’s La Confederation Paysanne*, as well as Belgium’s FUGEA and the COAG from Spain put forth the dangers FTAs like EU-Mercosur and CETA imply for farmers and -through our food- to consumers in Europe’s distant regions: the lack of traceability and the lack of controls of agricultural products that risk entering Europe with these FTAs and the unfair competition they promote would be a disaster for all but the corporate sector. Canadian farmer from La Via Campesina’s NFU, Jan Stomp, pointed out that in Canada, the CETA meant the loss, overnight, of 400 dairy farmers. 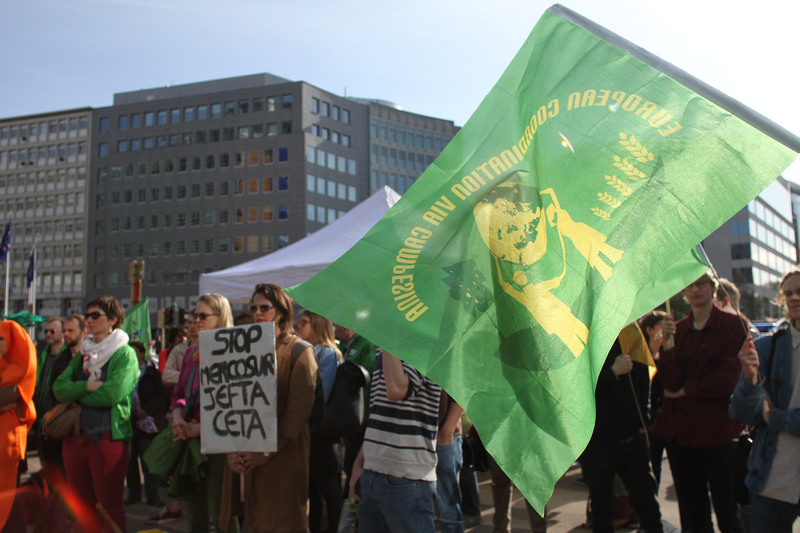 Other interventions this #17April in Brussels were given by representatives from the MIG (Belgian dairy farmers’ union), Friends of the Earth Europe and the CGSP (Belgian public service trade union). For more background on the meaning of this special date click here. For more information on this year’s #17April action please contact: andres@eurovia.org. * With delegates from Ardeche, La Reunion, Martinique, Mayotte and other territories.